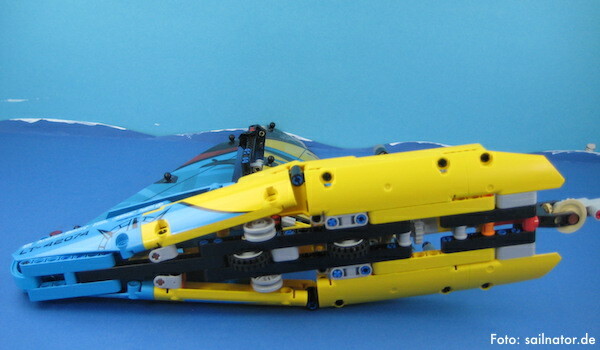 Kindly LEGO® sent me the Yacht for free for a review, but I am not payed for this blogpost and I am totally free in what I am writing about it. 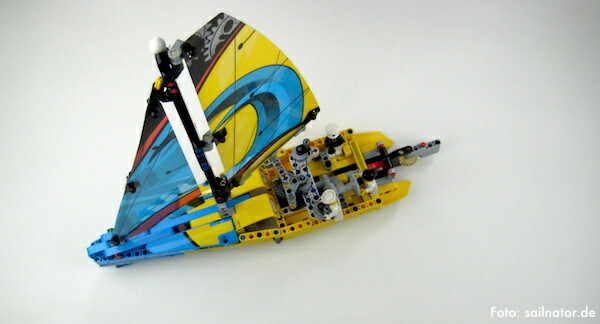 The Kit has 330 parts and is made for children of the age from 8 to 14 years. 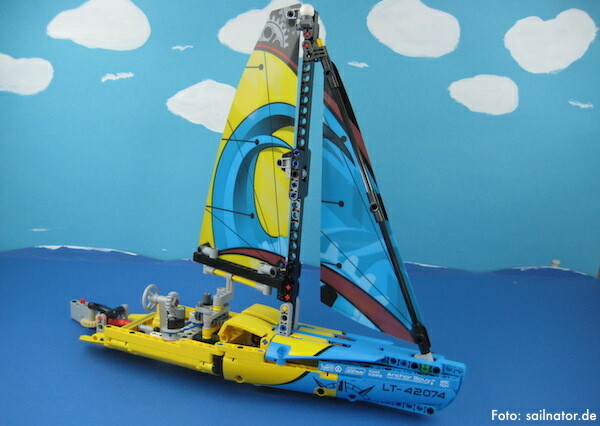 It is a 2 in 1 model from which you can build a single-hull sailing yacht or a racing catamaran. Both versions are not buoyant. 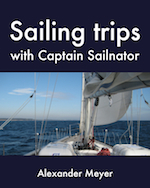 In this blogpost I’ll only introduce the monohull, so you still have something you can look forward to. 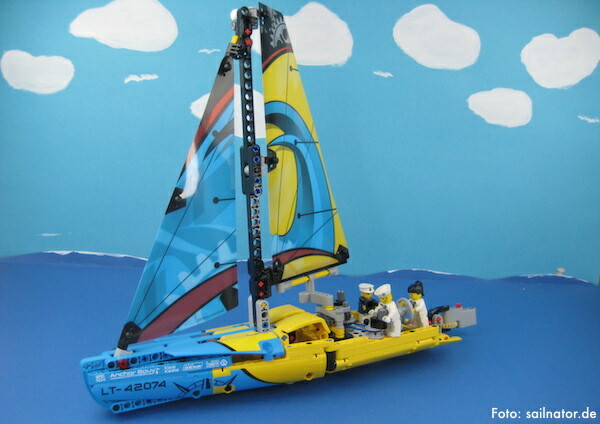 The boat is probably the closest to a Volvo Ocean Racer in terms of looks and scale. I think the hull looks very interesting and is reasonably realistic within the possibilities. The beautiful and bright colors immediately catch your eye. At first, they might seem a bit over the top but somehow the design is very exiting. 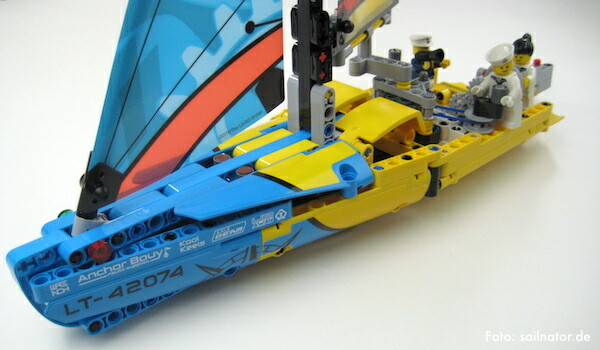 Much of the effect comes from the stickers on the hull and from the lines on the foil sails. 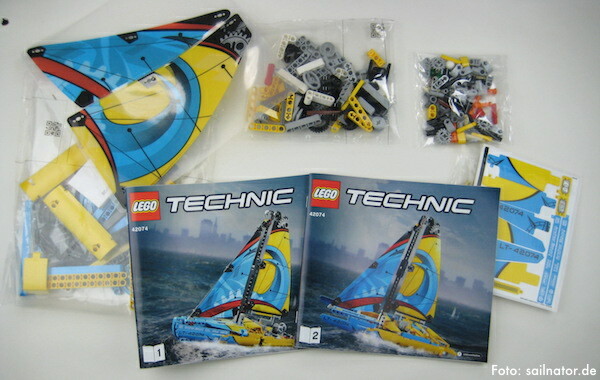 I think it is the first time LEGO® used sails from this material, but I am not sure. Unfortunately, the jib sheets are missing and the entire rig also seems a little bit too small. The mast could have been higher and the mainsail is attached to Port side of the boom and not on top of it, so that it only looks really nice if the boat sails on port tack. Overall, the lines and shapes on the hull and on the sails bring specific dynamic to the Boat and I like that personally very well. 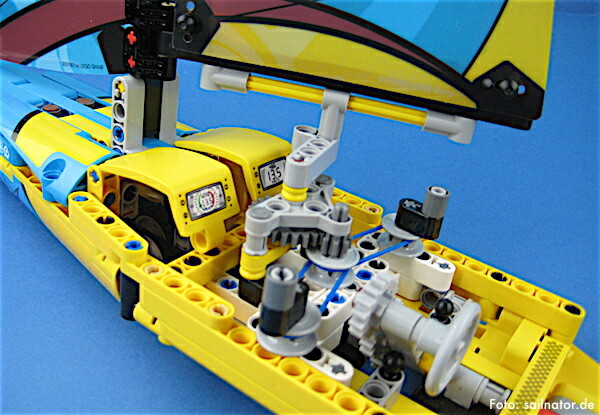 One interesting detail is the steering mechanism with which you can move the rudder. Because there is no dual wheel system the wheel can be slid over from one side to the other. That way the helmsman can always stand on the windward side, no matter on which tack he sails. 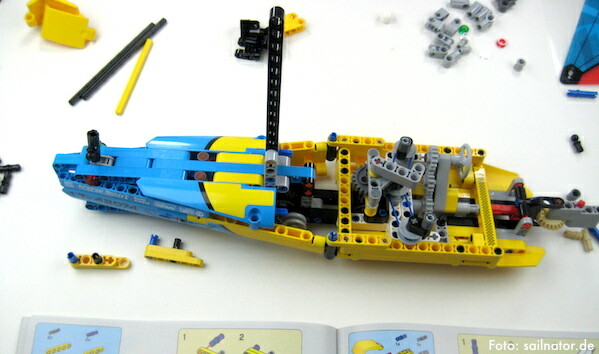 The gears between the helm and the rudder are still running smooth. There are two winches to operate the mainsheet. The sheet is replaced by a pretty well thought through pole-mechanism. 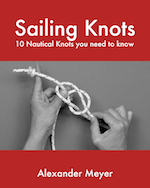 With that the mainsail can be pulled endlessly from one tack to the other. Unfortunately, with this the mainsail can only be eased up to beam reach. Well, one could imagine that a Racing Yacht sails so fast that the apparent wind is always on the beam ;) Anyway, it is quite enjoyable to operate the winches and to see how the sail is moving and it is amazing how well the two rubber bands run over the rolls, which makes the whole process possible. At the bottom of the hull two wheels with tires are mounted one behind the other. They make it quite easy to push the boat and play with it. At the level of the front wheel, two smaller support wheels are attached left and right of it. That way the boat tilts always on the one or other side if you push it. That presents probably the heeling of the boat when sailing. What I really like about the kit are the many small details such as the navigation lights on the bow and the instrument stickers on the hatch of the companionway. The hatch can also be folded up, so that you can get below deck. What is missing for the big fun while playing is a crew, fully equipped with life vests and foul weather gear! The figures you see on my photos are not included to the kit and are leftovers from my „Learn to Sail“ Stop-Motion-Videos with Captain Sailnator →. 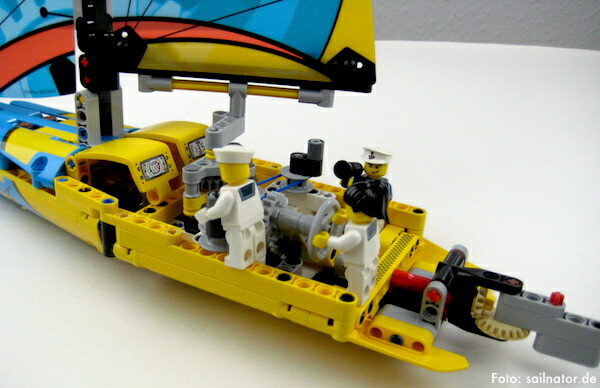 But overall I think that despite of the small weaknesses of the racing yacht it is very close to reality. The assembly really was a lot of fun even though I am in my fifties now. 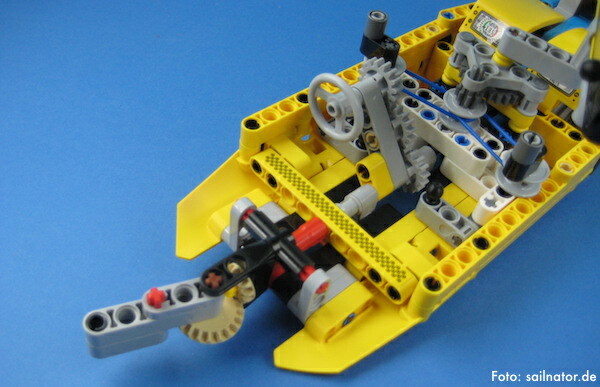 It brought back some very nice memories from my childhood with LEGO®! It took a little while until I remembered how it works, but then the time flew by. 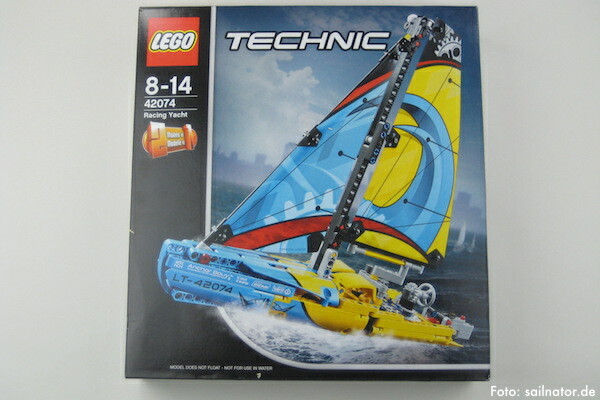 I already caught myself by searching for other LEGO®-kits on the internet. Meanwhile I gave the Yacht away to my 10 years old nephew, who was very exited about it. 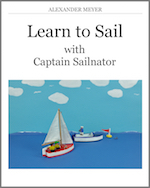 He now wants to learn to sail and wishes to receive my book: „Learn to Sail with Captain Sailnator“→ for his birthday!